Travel means to go from one place to another, but there is waiting in the going: for the airplane/train/bus, for customs, for permits, for my jet-lagged husband to wake up from his nap, for the rain to stop, for our dugout canoe to come up river - time to make books. My supply list is stepped in groups of supplies I add into my travel kit as space/type of travel permit. Figure 1: Santa Monica origami booklet. I work on a sketchbook or clipboard in my lap. Pages fold into pamphlets or turn into origami booklets. Drawings and text are done with black, sepia and sanguine brush pen sets with 4 different tip styles. Later, these are bound or cut with other colors added if needed. 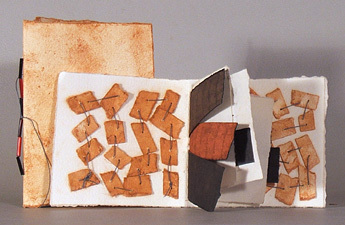 This series began with a New Zealand railroad track as a device to unify the origami booklet space. The railroad morphed into fences, game boards, sidewalks and freeway. After the 2005 ARLIS Artists' Books Conference in LA, my friends and I spent the morning on the Santa Monica Beach boardwalk and the afternoon stuck on the Santa Monica Freeway. The outside pages of Santa Monica are the beach; unfold the booklet and there is the freeway. The best rooms have a table and chair plus a window with a view. My favorite was on Oxford Street in Sydney, Australia where there is always action on the street and a glimpse of the harbor. In my checked luggage I carry scissors and Exacto knives, paints and adhesives for a broader range of looks and books. Earplugs are handy to block TV's and noisy neighbors. Check out art shops and markets for unique papers, supplies and books. Figure 2: Black Hills series of pamphlets. We stay with friends in many places where I can set up more stable work areas. We spent a week in a New Zealand potting shed in a forest of tree ferns, months at a tradestore in New Guinea with a covered veranda to work on and constant curious children peeking over the railing. In the Black Hills of South Dakota, we had a suite with a kitchen where I could mess around. Wild turkeys left feathers on the terra-cotta dirt outside. I tore paper to get deckle edges and soaked them in red mud soup. A tribal gallery in Rapid City supplied beads and colored thread. We buy artifacts. My husband, Ron Perry, and I are sitting under the men's ceremonial house in a jungle village waiting for Peter Dimi. He is repairing our outboard motor. We hope he is picking up more drums of fuel and coming up river in our double canoe. It's muggy hot. Mosquitoes are buzzing about. We've finished buying, no work to keep busy. It might be hours, days ... depends. Next to me a man is carving a clan mask. I get to work, too - in my mind where I have a lot of stuff stashed away. There's Peter, traveling on the river between his bush village and the post-colonial coastal town, once to California and back. Many people I know live in two or more worlds, dos-à-dos. Those dualities became part of the motif in my Barrio y Calle book series. Artists create everywhere from the smallest bush camp to the biggest city. Art is made from anything, but I work with light fast pigments and acid-free papers. If I make a good piece, I want it to be with good paper and pigment - and I have that Western illusion of permanence. Below, starting with the Airport Studio, are supplies I take with me for making small booklets and pamphlets. Add in items from the succeeding groups to create your own Studio to Go. In checked luggage: Organize supplies in a lightweight, waterproof briefcase or backpack which can be put in a larger suitcase or pack. The idea is to have a compact set of materials that is easily carried and quickly packed. Carolyn Leigh is a traveler, painter and book artist based in Tucson, AZ USA and Alamos, Sonora, Mexico. First published: Ampersand, the Quarterly journal of the Pacific Center for the Book Arts, Summer 2008. 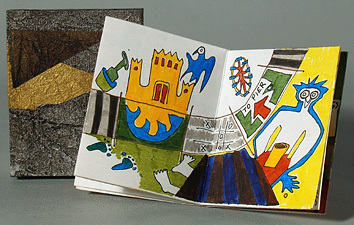 Reprinted in Paperworks, the Journal of the Sonoran Collective for Paper and Book Artists, Spring 2009, Vol. 9.3.